ATM cards seem to be safe no longer as thugs cloning ATM cards to fraudulently withdraw money of cardholders are on the prowl. 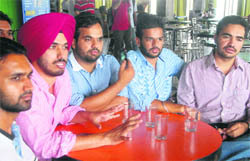 In the August 12 incident in which car-borne youths had fired three rounds of gun shots, injuring a commando of the Punjab Police, near Burail Jail close to Phase IX, Mohali, the main suspect in the case has turned out to be a former president of the DAV Students Union, Amandeep Multani. The Chandigarh police today arrested three persons from Amritsar who had allegedly connived with the two Australian nationals and their Ropar-based NRI associate for hatching a conspiracy to kidnap a city resident for a ransom of Rs 1 crore. The police has also arrested a shopkeeper from Sector 17 here who sold knives to the accused. The authorities at the Government Multi-Specialty Hospital (GMSH), Sector 16, seem to have learnt no lesson from the death of a newborn at an OPD last month due to a ‘system failure’. Private multi-speciality hospitals here have shown lack of concern for the poor by refusing to provide free facilities to the BPL (below poverty line) families.Efforts were made by the Punjab Health Systems Corporation (PHSC) and the Greater Mohali Area Development Authority (GMADA) to persuade many such hospitals to show generosity, but all in vain. Alumni of various Indian Institutes of Technology (IITs) were in the city today to promote the forthcoming global conference, PanIIT2010, to be held at Noida in October. The Chandigarh bench of the Armed Forces Tribunal (AFT) has held that issuing of a show-cause notice to a delinquent is mandatory if he is to be discharged from the service. Mere warnings are not sufficient to terminate an employee’s services. The University Institute of Engineering and Technology (UIET), Panjab University, today announced the launch of its national event called “Effi-Cycle” in which 18 teams comprising engineering students from top educational institutes in the country will participate to create a vehicle that runs on human power. Taking cognisance of the minor blast in a laboratory of HS Judge Dental College, Panjab University, RC Sobti, Vice-Chancellor, has constituted a four-member committee to probe the incident and suggest corrective steps to be taken by the university. Even as the sole eyewitness of the road accident that claimed lives of two cousins, Sarabjit Singh, had been claiming that Sukhmani Brar was drunk at the time of mishap, the police had not recorded it in the first information report (FIR).Investigators had not taken the fact on record in the FIR and mentioned that circumstances of the mishap were not in detail. Chandigarh, August 21 Nothing can be more humiliating for defence personnel than being pushed out of civilian premises after public humiliation.A sergeant, proceeding on annual leave, was humiliated and thrown out of the railway booking counter yesterday after he argued with the clerk over denying him concession on the ticket of his physically challenged son. Coming to The Tribune office immediately after the incident, the sergeant broke down while narrating his shocking encounter.Sobbing inconsolably, he mumbled, “Looks like there is no pride left in our services. Chandigarh, August 21 A team of Chandigarh Municipal Corporation during a surprise raid yesterday fined parking contractors in different parts of the city for irregularities in maintaining parking lots.The team under the supervision of Joint Commissioner TPS Phoolka conducted the raid in Sectors 22, 34 and 35 and imposed a fine of Rs 22,000 on the contractors for violating the parking norms. 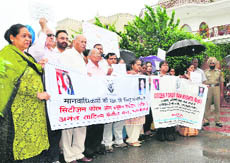 Alleging the police inaction, residents of Rajiv Colony staged a demonstration and raised slogans against the police in Sector 16 here this evening.The residents alleged that the police had failed to arrest the accused, even though the police had witnessed assault on a labourer, Rajesh Kumar, near Labour Chowk located near the area police station yesterday. A 56-year-old road accident victim died, reportedly due to delay in medical assistance, here today.The deceased was identified as Inder Nath Sharma, a resident of Dashmesh Enclave. 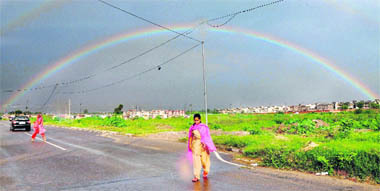 The city has been witnessing light to moderate showers since last evening.Rain caused waterlogging and traffic jams were reported from various parts of the city, including roundabouts of Sectors 26, 27, 28, 33, 34, 21 and 22, Hallo Majra and Airport traffic light points. Dysfunctional traffic signals at various crossings added to the chaos. The inquiry report of the death of newborn at Government Multi-Speciality Hospital has created a flutter among doctors in the hospital.All the doctors, not satisfied with the findings, met the director, health, here this afternoon. The Central Administrative Tribunal (CAT) has served a notice on Engineer-in-Chief, Army Headquarters, as the latter failed to comply with the tribunal’s orders pronounced in 2006 regarding the promotion of superintendents. The city audience was treated to a memorable puppet and shadow art show by the internationally acclaimed Hanan Puppet and Shadow Art Troupe of China at the Law Bhawan auditorium here today. Musical bonanza by Dolly Guleria, a renowned Punjabi singer and daughter of Punjab nightingale Surinder Kaur, was witnessed here at Daliha Garden, Sector 36, on the occasion of Teej celebrations today evening. With the Students Organisation of Panjab Union (SOPU) announcing its poll agenda and panel, battle lines have been drawn for the upcoming student election on the Panjab University campus. “Horlicks Wizkids 2010” was organised in Tagore Theatre by Krayon. More than 1,800 students across 28 schools from the tricity participated in various events like antakshri, quiz, face painting competition, dance, etc. The local Citizen Club organised a function to create awareness among residents regarding pollution-free environment and importance of trees. Club president Advocate Manpreet Singh Sahi said the club had initiated the project to plant saplings at various public places. On the occasion, besides planting the saplings, saplings of “tulsi” were distributed door to door. A female clerk deployed in the education department at Rajpura has been accused of usurping more than Rs 85 lakh from the General Provident Fund (GPF) since 2001.Officials in the education department lodged a complaint in this regard with the police yesterday. However, the police has not registered any case. The CBI today moved an application in the court of special judge (CBI cases) Balbir Singh to cancel the bail granted to former SGPC chief Bibi Jagir Kaur and seven other accused in the case of the alleged murder of her daughter Harpreet Kaur. A middle-aged person was electrocuted late last night when he came in the contact with a high-tension wire passing over the roof of his house. The police has booked a woman on charges of concealment of birth after the body of a premature stillborn female child was found in a toilet of the PGI on Friday.Police investigations later revealed that the woman was not medically fit and was not aware that she had delivered the baby. Chandigarh, August 21 Two persons, including a child, were injured in two different road accidents in the city.Harnek Singh, a resident of Mauli Jagran Colony, filed a complaint alleging that a car knocked down his 12-year-old child near Azad market, Sector 20, on August 19. The victim was admitted to the PGI. The Rock Rovers Hockey Club (RRHC) will organise an eight-day 9th SN Vohra Memorial Hockey Tournament to be held at the Sector-42 Hockey Stadium from August 22. Anil Vohra, organising secretary, RRHC, said the inaugural match would be held between Shivalik Hockey Academy, Mohali, and MBCT Academy, Bassi Pathana. The second match would be played between Karnataka Sub-Junior XI and Mehta Gurukul Academy.